The noblest tradition nests in the natural beauty of Portugal's most ancient region. In the north-western part of the country lies this land of dense vegetation and profound historic wealth. It was here that Portugal's first king, Dom Afonso Henriques, was born in the beginning of the 12th century, having then extended the kingdom to the south, in what was considered as one of the most heroic feats of the Christian Reconquest. The country's longest motorway (A1, from Lisbon to Oporto) goes up to Braga (A3), in the heart of Costa Verde. If you follow the coastline on the road from Vila do Conde to Valença, you will not miss the beautiful beaches, seaside resorts and enchanting villages such as Caminha and Vila Nova de Cerveira. Inland and worthwhile visiting is the Peneda-Gerês National Park. Throughout the region the rivers, waterfalls, vineyards and fertile plots combine with the ancestral monuments in urban centers. Oporto, the capital of the country's northern regions, with its international t airport, offers the delights of a riverside city as it is magnificently situated on the mouth of the Douro river, from where boats leave to sail up the beautiful river. Amarante - crossed by the river Tâmega and surrounded by mountains, this pretty town proudly displays its 17th century mansions, with colourful balconies of painted wood brightly decorating the narrow streets, its restaurants with terraces overlooking the river or the beautiful bridge of São Gonçalo which leads to the great monastery of the 16th century that bears the name of the same saint. Barcelos - medieval walled town with a dungeon. Worthy of a visit are the Ceramics Museum, the Archaeological Museum of the Dukes' Palace, the mother-church (Roman-Gothic), and the churches of Terço, Cruzes and Benedictine Convent. Walking tours: around the ancient Jewish quarter or in the streets with medieval houses and Baroque manors; boat tours: on the Cávado river. Boticas - where bucolic sceneries seem to depict an austere rural life characterized by ancient customs and traditions kept to this day. Such is the case of the "vinho dos mortos" ("wine of the dead"), a beverage which owes this original name to a piece of history: in 1809, the local inhabitants buried their wine to keep it from falling into the hands of the invading French. When Napoleon´s army was gone, they found the wine had improved; the bottles were termed "dead" and the practice of burying them for about two years still continues. Braga - Founded by the Celts in 300 B.C. and a Roman administrative center in 27 B.C., Bracara Augusta, as the Romans named it, combines the religious importance with today's commercial and industrial prosperity. Also deserving to be visited are the churches of Misericórdia (Renaissance), Pópulo (17th-18th centuries) and of Nossa Senhora Branca (18th century). 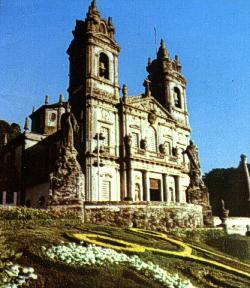 On the outskirts, 5 km away from the center, stands the Sanctuary of Bom Jesus do Monte, with its monumental Baroque staircase; the Sanctuary of Nossa Senhora do Sameiro; the ancient Monastery of Tibães, dating back to the Suevian period and rebuilt in the 11th century, and the Church of São Frutuoso de Montélios (7th century Visigothic temple). 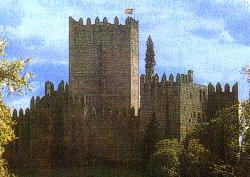 Bragança - Majestic city, with medieval castle and walls, amongst which is the Domus Municipalis, a unique example of civic Romanesque architecture. Special mention must be made to the Cathedral (16th century), Santa Maria Church, Casa da Misericórdia Chapel, Santa Clara Convent and Church (16th century), São Bento Convent and Church (17th-18th centuries), and the Abade de Baçal Museum. At the Railways Museum, 19th century locomotives and carriages. Cabeceiras de Basto - contains various splendid manor houses, dating from the 17th, 18th and 19th centuries, and what is considered the best of the statues of the region, O Basto. Made of granite and representing the body of a warrior, it is assumed that it was built before the coming of the Romans; after the Napoleonic wars it gained, as a joke, the head of a French soldier. However, the main attraction of Cabeceiras de Basto is the ancient and splendid monastery of Refojos, with a dome that stands 33 meters (110 feet) high and statues of the Apostles and the archangel Michael. 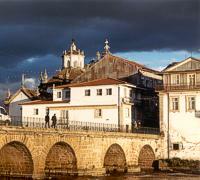 Caminha - the ancient fortress town of Caminha overlooks the river Minho and is rich in historical and architectural patrimony. 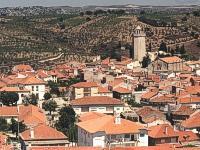 The whole town is appealing, with its manorial houses and Medieval defensive walls that seem to whisper old tales and legends, the Gothic mother church, the attractive main square with popular cafés and exhibiting the 15th century Clock Tower, a Renaissance fountain and the 15th century mansion of Solar dos Pitas, with seven fine Manueline windows on the upper storey. 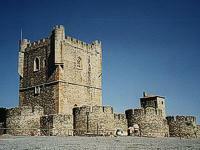 Chaves - The 14th-century keep of Chaves castle overlooks the town's medieval square - Praça de Camões. Within the castle keep is a small military museum where suits of armour, uniforms and other regalia are on display. On the south side stands the parish church with its fine Romanesque portal. The Baroque Misericórdia church opposite has an exquisite interior lined with 18th-century azulejo glazed tiles. A few minutes on foot from the city center is one of the hottest springs in Europe. Water here bubbles up at a temperature of 73ºC (163º F). The spa's facilities attract both tourists and people seeking the treatment of rheumatism, kidney disfuntion and hypertension. Freixo de Espada a Cinta - it is imperative to visit the Manueline Mother Church with its exquisite 16th-century portal which leads the visitor into a rich interior, resembling a small version of the Jerónimos Monastery, at Lisbon. The panels of the altarpiece are attributed to the brilliant Grão Vasco (1475-1540) and include a beautiful "Annunciation". The pillory, also Manueline, is one of the best preserved and most interesting of the country, and the Misericórdia Church is also worth admiring, with its Gothic niche over the main doorway. Guimarães - Portugal's birthplace, with medieval castle and walls, houses a magnificently well preserved historic center. In the cloisters of the Church of Nossa Senhora da Oliveira is the Alberto Sampaio Museum; in the cloister of São Domingos Convent is the Martins Sarmento Museum; and in the ancient Dominican Convent is the Sacred Art Museum. Also deserving special mention are the medieval palace of the Dukes of Bragança (15th century), the Church of São Miguel (Romanesque), the Church of Santos Passos (Baroque), and the Monastery of Santa Marinha da Costa (a pousada). Nearby lies the early settlement of Briteiros. Lamego - From the heart of a verdant park rises the Sanctuary of Nossa Senhora dos Remédios, with its magnificent Baroque staircase (686 steps). Medieval monuments: castle, tower-fortress (12th-13th centuries) and Almacave Church. Also worthwhile visiting are the Renaissance churches of Chagas and Santa Cruz, and the Regional Museum. In Balsemão, the chapel of Suevian-Byzantine origin (7th century). Melgaço - the small and tranquil town of Melgaço grew around a fortress built by order of Afonso Henriques, the first king of Portugal (1139-85). Mesão Frio - although small, the town of Mesão Frio is worth visiting to admire the ancient pillory, the fine mother church of São Nicolau (rebuilt in 1877, it kept the magnificent 16th-century ceiling panels, each one featuring the portrait of a saint) or the cloisters of the former 18th-century Franciscan monastery (Convento de São Francisco) which now shelters the tourist office and the Town Hall. Mirandela - it is worth visiting the 17th-century Mother Church and the Town Hall, also dating from the 17th century and which used to be the ancient palace of the Távoras (this important family was accused of attempting regicide in 1759 and all trace of them was eliminated from the town). The Sanctuary of Nossa Senhora do Amparo (Our Lady of Comfort) offers wonderful views of the environs. Murça -it is worth admiring the magnificent pillory in front of the Town Hall, which was once a convent of Benedictine nuns and stands near the Mother Church, built between 1707 and 1734. The facade of the Misericórdia Church is equally interesting. Ponte de Barca - Jardim dos Poetas ( Garden of two Poets) lodges some of the main monuments and is ideal for picnics or for taking a stroll due to its tranquil atmosphere and bucolic scenery. Near the river, the large open-air market also attracts many visitors. Póvoa de Varzim - is both a traditional fishing town and cosmopolitan summer resort for the people of northern Portugal. At one end is the port and picturesque fishermen's quarter, where the men arrange their brightly-painted boats and the womenfolk quietly sit mending their husbands' nets. A small 18th-century fort guards Póvoa de Varzim's busy harbour. The town's parish church was built between 1743 and 1757, while the church of Nossa Senhora da Lapa dates back to 1772. Santo Tirso - Santo Tirso grew around the former monastery of São Bento, founded by the Benedictines in the 8th century, later rebuilt and then modified in the 17th century. 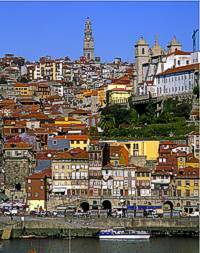 Viana do Castelo - Spread along the north bank of the Lima estuary (where one can take trips on typical boats), this town is famous for its handicrafts and colourful regional costumes. Deserving special mention are the mother-church, the ancient Paços do Concelho (both Gothic), Casa da Misericórdia (Renaissance with a sacred art treasure), the medieval Casa dos Arcos, the Convent of Santa Ana (16th century), and the Regional Museum. Up above and dominating the city is the Sanctuary of Santa Luzia, with a fantastic view of Viana, the river and the ocean. Vila do Conde - Ancient medieval shipyard. Interesting architectonic places to visit such as the mother-church (Manueline), the Santa Clara Convent (18th century), the Misericórdia Church (Renaissance), the Aqueduct, and St. John the Baptist Fortress. This town is also famous for its lace. Vila Praia de Âncora - In the heart of the beautiful garden that is the Minho, the perfect setting between the sea, the countryside, the rivers and the mountains. Vila Nova de Cerveira - the small walled town of Vila Nova de Cerveira was founded in 1320 by king Dinis, after whom the magnificent pousada, installed in the 16th-century castle, has been named. It is worth visiting the Mother Church and the Misericórdia Chapel. Vila Pouca de Aguiar - an ancient town, it exhibits several fine houses and manors, such as the Casa do Cimo da Rua (literally, "House of the Top of the Street"). At the foot of the Padrela mountain, inserted in the green landscape, the small and graceful Sanctuary of Our Lady of the Conception offers a superb panorama of the town and of the fertile plains of the Aguiar valley. 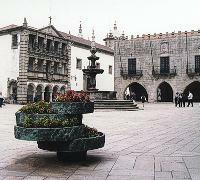 Vila Real - founded in 1272, its monuments reflect the city's long history. A town with great diversity of religious architecture: Cathedral and São Brás Chapel (Gothic); churches of São Pedro and Misericórdia (16th century), São Dinis (16-18th centuries) and the Baroque Capela Nova and Clérigos Church. 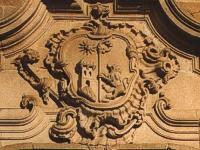 Also worthwhile visiting is the famous Mateus Palace, a Baroque masterpiece, where cultural events are currently held. In the Costa Verde region, one finds all the delicious northern dishes as the "caldo verde", the codfish, pork filets ("rojões"), duck with rice, as well as other typical regional meals. In Viana do Castelo, the rice with codfish and the octopus "à Margarida da Praça" style. In Caminha, the steamed conger-eel, the whiting and the bream. In Paredes de Couro, the codfish "Miquelina" style;: in Monção, the roasted kid, the shad and the lamprey; in Melgaço, the smoked hams; in Oporto, the famous tripe. On the dessert side, one can relish the rich and varied pastries traditionally baked by the nuns - "S. Gonçalo" and "papos de anjo", the "doce de travessa", the "arroz doce" (sweet rice) and the "aletria", the "rabanadas", "sonhos" and "mexidos" (popovers and sweet dumplings), the delicious "pão de ló" and the egg yolk and almond paste based pastries. 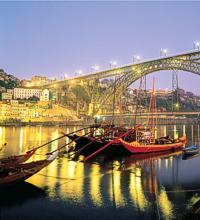 As for as drinks are concerned, the Port wines and the Vinhos Verde are a must. Embroideries, linen, textiles and tapestry. Works in wood, leather, copper, tin, wrought iron, wicker and osier.